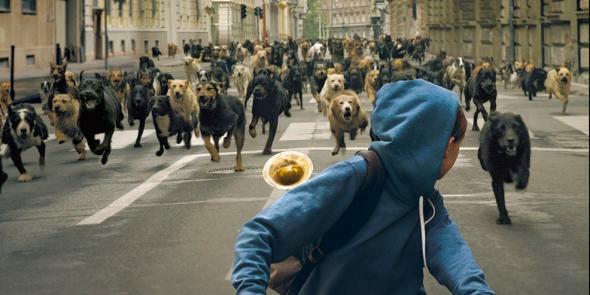 White God movie interview: How Kornél Mundruczó staged an uprising with 200 dogs (VIDEO). In the upcoming movie White God, which won the Un Certain Regard award at the 2014 Cannes Film Festival, the canine actor Bodie plays Hagen, a mutt that—after he is separated from his owner—leads an uprising of hundreds of dogs against the men who mistreat and abuse them. To stage these sequences of doggie upheaval, the filmmakers used dozens of real dogs. The results are awesome. And they make you wonder: How did they pull this off? We sat down with director Kornél Mundruczó, trainer Teresa Ann Miller, and star Bodie to ask them how they cast Bodie in the role of Hagen, how they shot the movie’s canine POV shots, and how they managed to create the illusion of dogs in danger while still protecting the dogs.